Revisiting Cosmos, raising kids, quitting smoking, viewing many videos and more! New Cosmos series - Can’t wait! Raising Skeptic Kids on Science-Based Parenting - But are science-based rugrats less bratty? Okay, now. I first happened upon a YouTube collection of evolution documentaries called Why Evolution Is True Channel while looking at a group of videos made by the Cassiopeia Project called Facts Of Evolution. (More on the Cassiopeia Project next week.) I wanted to know who uploaded the video, to subscribe, and that’s when I found the Why Evolution Is True Channel. Click on this and you will find an astonishing collection of videos produced by just about every media outlet, university and website that concerns itself with science education and in this case, specifically, evolution. Really, it’s pointless for me to list all of the menu choices. Just go there and be amazed. There are literally days’ worth of great videos on evolution, if you actually put that much time into it. And they run from short to full-length episodes. Better still, the there are videos for both kids and adults, and those that play to all ages. Some are simple overviews of different aspects of evolution and some get into more detailed and advanced concepts. There are also histories galore. What I found difficult was to figure out who was making all of these videos available to us in one place. 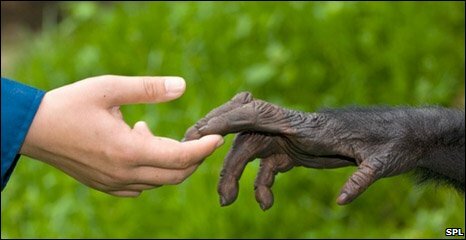 Who is behind the Why Evolution Is True Channel? And here’s my answer. I don’t know. There are many likely suspects, like Jerry Coyne who wrote a book and has a blog by the same name. But no. He doesn’t seem to be associated with the site. I can’t rule him out, however. Maybe it’s a fan of his? Others came to mind and proved to be dead ends in my search. But someone is putting this collection of videos together, so if you know, please tell me who or what organization is doing it? Because the Why Evolution Is True Channel is a great resource and someone deserves a big thank-you! Wednesday the 27th: Terry is skittish and pulled his money out of the stock market due to the problems being caused by a few House members. Boron10 dropped in. Always good to see him. Ky has finished Michael Shermer’s latest book, The Believing Brain: From Ghosts and Gods to Politics and Conspiracies — How We Construct Beliefs and Reinforce Them as Truths. He enjoyed it and wants to read all of Shermer’s books. I warned him off of The Mind of the Market. Sue me. So let’s see… Someone named Sanity was there. And alienist also came by for a while, along with the usual rouge’s gallery of SFN chat enthusiasts. We actually discussed topics of concern to skeptics, which isn’t always the case in chat. And without a chat log, that’s about as good as I, Kil, can do. But hey… We had a good time. That much I remember. Paranormal America: Ghost Encounters, UFO Sightings, Bigfoot Hunts, and Other Curiosities in Religion and Culture, by Christopher Bader, F. Carson Mencken and Joseph Baker. “A significant number of Americans spend their weekends at UFO conventions hearing whispers of government cover-ups, at New Age gatherings learning the keys to enlightenment, or ambling around historical downtowns learning about resident ghosts in tourist-targeted ‘ghost walks’. They have been fed a steady diet of fictional shows with paranormal themes such as The X-Files, Supernatural, and Medium, shows that may seek to simply entertain, but also serve to disseminate paranormal beliefs. The public hunger for the paranormal seems insatiable. Drawing on the Baylor Religion Survey — a multi-year national random sample of American religious values, practices, and behaviors — as well as extensive fieldwork including joining hunts for Bigfoot and spending the night in a haunted house, authors Christopher Bader, F. Carson Mencken, and Joseph Baker shed light on what the various types of paranormal experiences, beliefs, and activities claimed by Americans are; whether holding an unconventional belief, such as believing in Bigfoot, means that one is unconventional in other attitudes and behaviors; who has such experiences and beliefs and how they differ from other Americans; and if we can expect major religions to emerge from the paranormal. Religious indoctrination of children child abuse? There were 5,675 daily visitors this week. There were 25,734 daily visitors in July, 2011.